REGION - All of California. I am here to help with all your questions in regards to Toyota leasing. Email/Call/Text for a Full Price sheet. No Pressure here just amazing deals. I have helped a crazy amount of people on this page so I hope to get some reviews showing that. Many have shopped my deals and found them unbeatable. (I try my hardest). Just purchased my Leased 2018 Toyota RAV4 SE Hybrid AWD today from Cody. Great guy. Gives you all the numbers and works with you in all instances. We had a current lease and needed more miles on my new lease. Got everything settled before we got to the dealership. No hassle, No haggling, great text communication. THANK YOU CODY!!! We will be back. A+++ to Cody Drove up from San Diego deal was exactly as stated as well as my trade. Probably best to PM Cody so we aren’t flooding up his review thread with unrelated questions. But also just popping in to say that while I haven’t worked with Cody, he has been a friendly, knowledgeable contributor to the forum. If you are in California and remotely thinking of a Toyota, start here first and simplify your decision. I compared nearly every three-row import on the market but nothing, including E-Plan pricing could stand up to the upfront Cody Spreadsheet. Just leased a 2018 Highlander SE from Cody/Tustin Toyota. With over a dozen vehicle transactions under our belt, this was the most painless experience ever. My wife who dispises the haggle didn’t feel any pressure whatsoever. Everything was straightforward and no dealer markups to be found. We made an appointment and put two SE’s together to review paint colors and options to finalize our decision. We test drove, secured our questions, made our decision and took the requisite jumping photo with keys in hand! Finance was quick, we selected gap insurance for our own piece of mind, vehicle was detailed and we were out the door in no time. Thanks Cody, you’re the best! Cody helped my buddy purchase a new Tundra. Shopped around several dealers in the area and he gave us the lowest price from the get go. Very professional and efficient. No BS, no smoke and mirrors, 0 pressure. Anyone that wants to lease OR purchase a Toyota needs to see him. Thanks again! I originally contacted Cody and his team to lease a Mirai, but due to location changes I ended up purchasing a Prius Prime instead. Cody and his team are very responsive, courteous, and they actually have the best price out of all the dealerships I contacted. Although I did not work with him in person, Cody coordinated closely with his team to get me the vehicle I wanted. Of note, the pricing to lease the Mirai was higher but they were willing to match my lowest offer. I decided to go with the Prime since there would be no hydrogen stations where I’m moving to. Make sure he’s on your list when considering a new vehicle. Cody Carter is the best representative I’ve ever met at any dealership throughout my life. His professionalism and simple straight talk make you realize very quickly that you can trust him to give you the very best deal he can write. 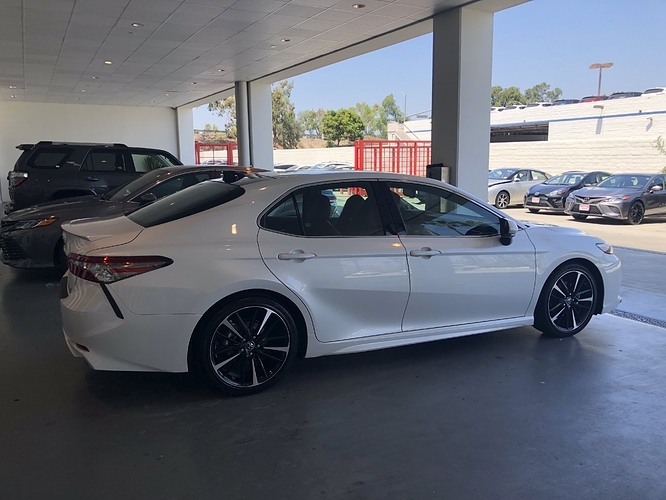 After texting some information over and filling out a credit app, I drove down to Tustin Toyota with my daughter to help her purchase her first car. Toyota should sign Cody to a super max contract. Earlier this week, I helped a relative get a new Camry. While there were many dealers to choose from, I went with Cody knowing there would be no hassles or surprises. It was a great experience from start to finish. 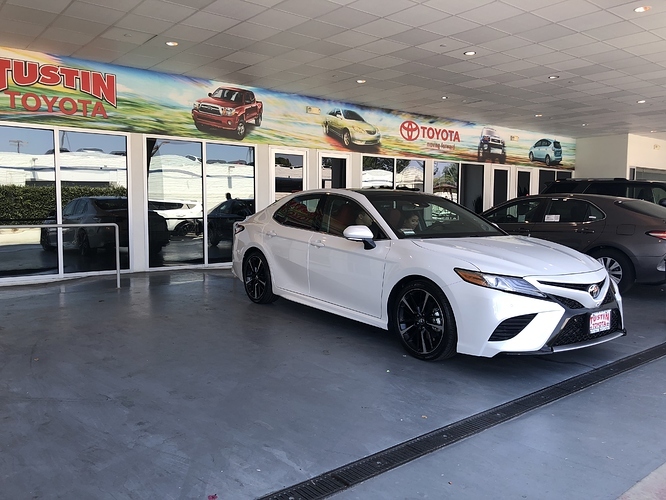 Cody responded to my texts quickly and found us the exact Camry we wanted, which was surprisingly rare – a pearl white four-cylinder XSE with red interior and pano roof. Thanks so much for the great review. It was great meeting with you. Could you provide the details of the deal? It was at invoice, plus all applicable rebates and buy rate (.00001 MF). You can get a much bigger discount from Cody for a model without the panoramic roof – but my relative insisted on this super rare Camry. Just leased a TRD Tacoma today from Cody, and it was a great experience. Everything we discussed via message was honored in person without any hidden fees or tricks. I’m very pleased with the experience and recomend him to anyone looking to get into a Toyota. I even drove from San Diego to get the deal done and I’m glad I did. Awesome experience with Cody yesterday leasing a 2018 Mirai. Set up the pricing and appointment time by text the morning of and had the car later that day. No surprises, just went in, got the credit check, and signed some financing paperwork. Just wanted to add another positive review for Cody. Leased a Highlander from him last week. I was not the easiest customer as I had limited credit in the US but he sorted us out where other dealerships let us down. Really great to deal with someone who knows what he is doing and is clearly good at his job, No added fees, tricks, attempts to upsell or anything else - 100% transparent and trustworthy. My favorite thing about him was when I said we would need one final day to decide on the lease. He did not blink at this, where other dealerships I have dealt with previously basically acted like I had just personally insulted their family. The best salespeople are always the ones who know not to be pushy. I just leased a 2018 Mirai through Cody and I must say this was the easiest experience I have had with a dealership. I received pricing from him by text, scheduled my test drive, and was able to sign all the paperwork in less than 2 hours. I would definitely come back to Cody and Tustin Toyota again once my lease is up. Just picked up a Toyota Mirai from Cody. Super smooth transaction and a great deal! I almost wish I had more money so I could keep buying cars from Cody! Will definitely reach out again if I need a Toyota.